The United Kingdom, made up of England, Scotland, Wales and Northern Ireland, respects Children’s Rights adequately. That said, this country can make progress in certain areas, such as violence towards children, trafficking of children, etc. More than 20% of youth under 18 years old live below the poverty threshold in the United Kingdom. This situation particularly concerns immigrant youth and those belonging to minority groups. 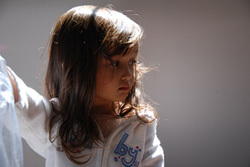 In the United Kingdom, about one child in ten is a victim of abuse. These abuses take on different forms: physical, psychological, sexual. For example, an estimated 5 to 10% of girls are victims of sexual abuse, compared to less than 5% of boys. Emotional violence, meaning negligence or non-protection of the child, is the most widespread form of abuse. Health personnel and social workers must strengthen their research efforts to discover the risk factors and solutions to the problem. Despite the presence of quality materials and health personnel in this country, certain health indicators are still too high. In fact, an estimated 6% of infants are born with low birth weight. Statistics in the United Kingdom show that eating disorders among children are rising dangerously. For instance, three children in 100,000 less than 13 years of age suffer from these disorders. Eating disorders manifest equally as anorexia or obesity. Experts have sounded the alarm and called upon health services and the authorities to react very quickly. The United Kingdom is not spared of trafficking of children. Generally, it is young girls who are the victims of this problem. Approached in their countries by traffickers who promise them a better life in the United Kingdom, these girls follow without knowing what awaits them. Upon arrival, they are sold as prostitutes to much-older men. This situation is catastrophic and appalling for these young girls. Forced to work for these men, they dread each day and its violence and forced sexual relations. Since the adoption of a statute in 2003, female genital mutilation is considered an infraction punishable by imprisonment for 14 years. The young female victims of this painful practice are often between seven and nine years old. Very often, this practice concerns children from immigrant families, in particular those with origins in Egypt, Eritrea, Ghana, etc. Children of ethnic and religious minorities are particularly touched by acts of discrimination. This alienation is illustrated just as well as the impossibility of obtaining an education as in the impossibility of living in a decent residence. Elsewhere, certain intolerance persists in regards to undocumented children. British authorities do not hesitate to deport these children arriving in the United Kingdom from their home country, without worrying about the situation that awaits them. With 9.4 tons of CO2 emissions per capita per annum, the United Kingdom is one of the worst studies in pollution on the planet. This impacts the lives of children and their future perspectives. All children have the right to live in a clean environment. The United Kingdom thus has progress to make in reducing its ecological footprint.